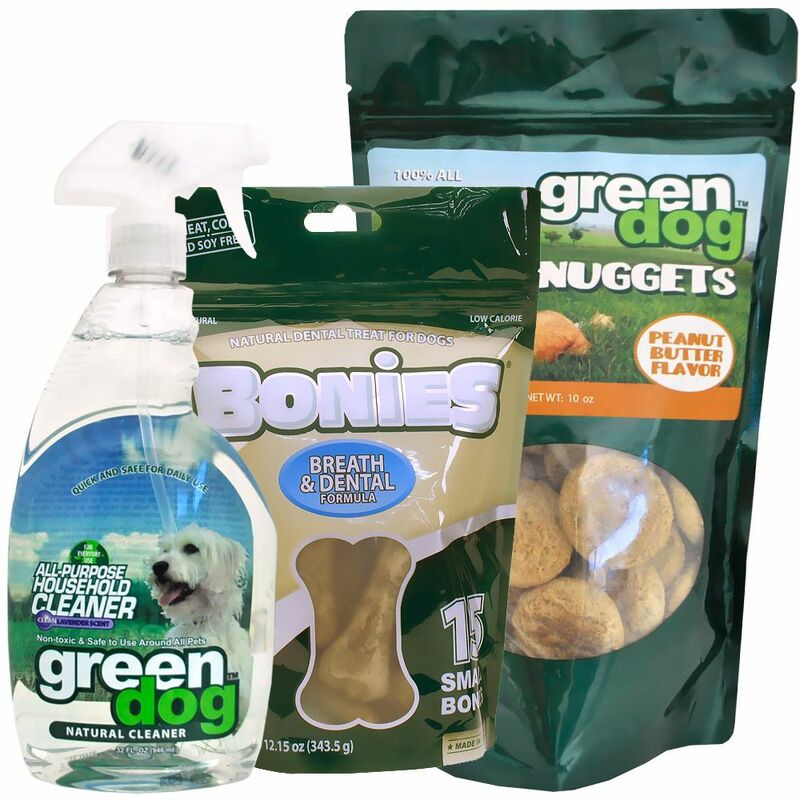 Green Pet Gift Pack for SMALL Dogs makes it easier for you and your pet to go green! Enjoy this gift pack perfect for all occasions, filled with Green Pet Treats for your pet and the All-Purpose cleaner to clean up afterward. 1 Green Pet Nuggets - Peanut Butter Flavor (10.5 oz) natural treats designed to make your dog feel healthy and happy all day long. 1 BONIES� Natural Dental Formula Multi-Pack SMALL (15 Bones / 12.15 oz) a unique dog bone that uses all-natural ingredients. Made to be a healthy treat for your dog while freshening their breath at the same time. Intended for dogs weighing 5-25 lbs. 1 Green Pet All-Purpose Household Cleaner (32 fl. oz) utilizes all-natural, non-toxic, organic ingredients that actually performs as well as conventional cleaners. Protecting your family and pet's health has never been so easy and effective. Created with safe and environmentally responsible ingredients, you will not only have a cleaner home but a Green Pet home! Inactives: wild Alaskan salmon, wheat flour, glycerin, propionic acid, natural smoke flavor, citric acid, garlic, calcium carbonate, natural mixed tocoph erols, rosemary extract. INGREDIENTS: Vegetable surfactants, emulsifiers, deionized water, organic fragrance. Feeding Directions: Feed one bone daily as a healthy and antural treat to help maintain fresh breath and clean teeth. Always supervise your dog to ensure that the treat is adequately chewed; have fresh, clean water accessible. Not recommended for dogs under 6 months. Directions: Spray evenly over surface to be cleaned. Wipe thoroughly with a clean dry cloth or paper towel. Store in a cool dry place.